No matter how seasoned you are as a runner, it is impossible to prevent unforeseen events such as minor injuries like sprains. Getting a sprain doesn’t mean that you are careless since sprains are often a result of running on uneven surfaces. When the ankle is twisted in an awkward position, some ligaments may tear and cause the sprain. For sure, you want to be back on your routine as soon as possible so here are valuable tips on how to heal a sprained ankle fast. Having a sprained ankle often means that either one or multiple ligaments of your ankle were stretched or torn during your run. Doing the right warm up exercises before run conditions your muscles allowing them to loosen. This is when the ankle receives damage to the high ankle ligaments. The reason you sprained your ankle is likely because at some point your toes were facing upward and heels were up. This put too much pressure on your ankles’ ligaments causing the sprain. A more serious sprain is if the inner side of the ankle is painful. In this case, a doctor should be consulted. If you have a general ankle sprain, taking a trip to the doctor may not be necessary. If you address the issue properly, you can cure your ankle right at home. Not wearing the right kind of footwear can increase the risk of spraining your ankle. This is probably one of the most common triggers of a sprained ankle that can also cause nerves to compress in your feet. Some symptoms that show you have wrong fitting shoes include getting blisters, getting inflamed tendon and having cracked toenails or bruised toes. This is also called a first-degree sprain and happens when there is only a slight tear in your ankle ligament. Your joint is unaffected and there are little pain and minor swelling. You may also feel stiffness in some areas. Degree sprain is more serious than the one above. Your joint is unstable and you may see some swelling. The pain is more serious especially when standing or walking. Sprain happens when the ligament is torn completely. In this case, standing or walking without any support is not possible. The pain is severe and swelling more prominent. If you experience the first or second kind of sprain, there are five things that can be done in order to heal your condition and avoid visiting a doctor. On the other hand, if you have a serious sprain, it’s best you seek professional help as soon as possible. The degree of the sprain. Sprains are categorized into three types depending on degree, third degree being the most severe. These may include simple exercises such as ankle rotations which can be done while sitting on a chair. Such exercises help the ligaments in your ankle to recover faster. Always rest if you feel any pain or swelling afterward. Since the calf muscles tighten after an ankle sprain, you need to stretch them so they return to their normal flexibility. An example is standing with hands placed on a wall and then stepping backward so your calf muscles stretch. This is only possible once you can at least stand without feeling pain. A simple way to do this is to push your foot toward a wall and hold the position for a few minutes. A sprained ankle often results in loss of balance. 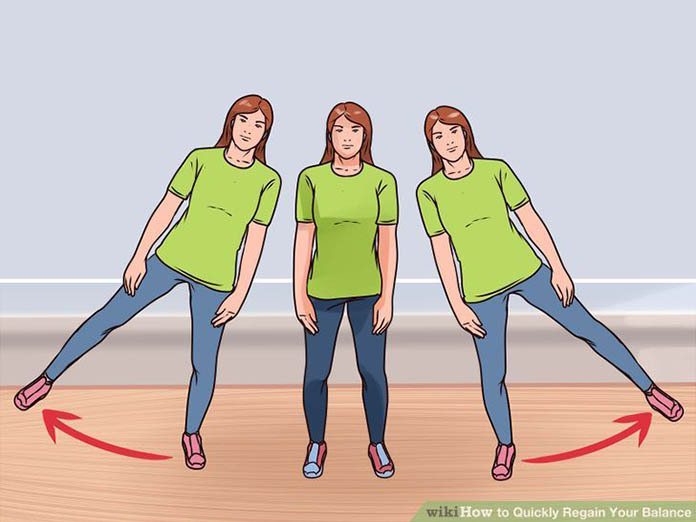 In order to regain your balance, stand on your injured foot and raise your other foot extending your arms. Experiencing a sprained ankle is not something you want to repeat. Once you totally recover, make sure you follow the following preventive measures. Always wear shoes that offer good support. Depending on the kind of terrain you will be running, purchase shoes that fit well and are comfortable. Be careful when running on uneven surfaces. This is especially since your ankle is still weak after injury. This may be include walking for a while before you run or lowering your intensity. 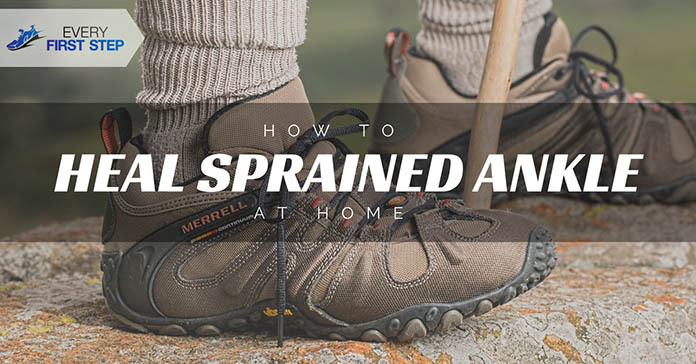 We hope you enjoyed our five tips on how to heal a sprained ankle fast. There is no need to be hasty about visiting a doctor especially if the sprain is first or second degree. No matter the cause of the sprain, following the P.R.I.C.E therapy method will ensure that you are back on your feet as soon as possible. If you have any suggestions of how to treat ankle sprains, we’d love to hear about them in the comments below. Please let us know what you thought about this article.